Check out the picture above to see if you have the same dashboard as it. This Jeep Grand Cherokee stereo is easy to upgrade. If you want to do it yourself, you need a wiring diagram or installation instruction from your dealer. If not, you’d better upgrade it in a car stereo upgrade shop. 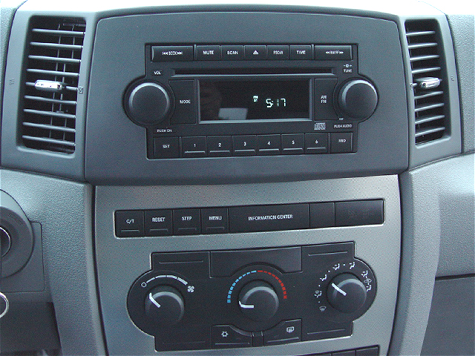 If it’s the first time you upgrade car stereos, you’d better ask a professional for help to ensure security. Please apply the parking brake before the upgrade. Please disconnect the negative cable on the vehicle battery to ensure security. Remove the trim panel and air vents. Use a lever to pry the gaps around the trim panel and the air vents. Pry it from one side to another for several times. Then, you can remove it easily. Remove the radio. Use a screwdriver to remove the screws which are at the 4 corners of the radio. Then, take the unit out of the dash and remove the wires at the back of it. Install the new unit. Take out the new unit and cables. Connect it to the car as your wiring diagram shows. Then, slide it into the dash by avoiding pinching the wires. Test the new unit. Connect the negative cable on battery and turn on the unit to test if it works well. You should pay attention to all functions, especially the functions with antennas or tools, such as, GPS navigation system, radio, TV, OBD2 etc. If you meet problems, you can contact your dealer for help. If everything’s good, you can install the trim panel back to the dashboard. Now, the upgrade is done. If you think it’s complicated to you, you’d better not do it yourself. Many stereos come with Warranty. You can contact the dealer for help once you meet problems. They can help with installation problems in a way. 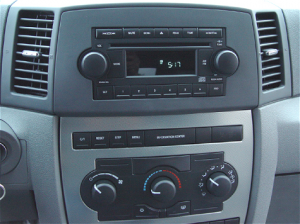 This aftermarket GPS stereo comes with USB port, SD card slot, AUX in and out, 3-Band EQ and so on. It supports 1080p HD video, night mode, IPod and IPhone music, rearview camera, Digital TV and so on. You can send a picture of your car’s dashboard with the year and model enclosed to our email sales@seicane.com now, and our pre-sale service team will check if this system works with your car. Before you order it, please add all the functions you want with it. You can contact the online customer service for more, too. Wish you like it and enjoy shopping on Seicane.